At first glance they might be sisters, but look again at this startling picture. They are, in fact, a 26-year-old mother and her daughter. 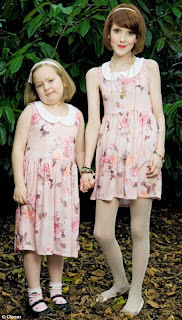 After suffering from anorexia for half her life, Rebecca Jones weighs five stone – less than her seven-year-old daughter, Maisy. And her terrifyingly thin frame is exacerbated by the contrast when they wear identical clothes.